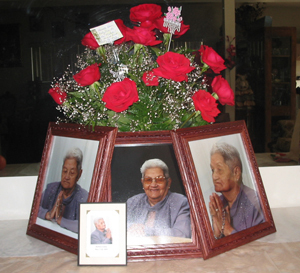 Today is October 9th, 2010, which means that it’s now eight months since my Grandma (Mamita) passed away. Straight up, losing her has been the hardest thing I’ve ever had to deal with. She was 101 years old when she passed, going on 102 and she was still the strongest and nicest person I’ve ever known. I miss her and it’s tough not having her wisdom, kindness and love around whenever I need it. This year (2010) has been one of the most difficult in my life and not being able to absorb her positive energy through her calming touch doesn’t make it any easier. With that said, if she could accomplish all she did and be a happy, strong and full of faith till her last days, then I know I owe it to her to do the same. Even through the worst though, I can’t help but feel like I’m blessed to not only have known her, but to hopefully benefit from her passing down at least a bit of the strength she had. I know I’ll make it through the hard times, it’s in my blood. Thanks Mamita, I love you for that and so much more. I’ll be sure to drink a glass of wine in your name today and celebrate your life through smiles and family. I’ll start with this great song from rapper Joell Ortiz, dedicated to his Grandma who passed away last year.